I would like to tell you a story from many years ago that I didn’t write about. It was back in the day when I was just beginning to earn my living as a writer, before I could come upon practically any situation, like today, and feel compelled to write about it. THIS WAS A LONG TIME AGO, when an attendant would pump your gas. While my tank was being filled, I stretched my legs. In those days, gas stations did not have mini-marts, only coin machines that dispensed a bottle of Coke for a quarter. Quarter in hand, I walked toward the machine, which was near the big window of the gas station’s greasy, cluttered office. Inside, an old man sat on a chair. I couldn’t tell what he was doing. But then on the window I spotted a handmade cardboard sign: “Fly Swatters Repaired.” Sure enough, he was repairing a fly swatter. For you youngsters reading this, I should tell you that fly swatters were not always made of plastic. They once had a wire mesh webbing that was superb for obliterating a fly. I can’t remember now exactly how the man repaired his fly swatters because I wasn’t curious about everything then like today. But I do recall thinking that you could buy a brand-new fly swatter for less than a dollar. So how could a person earn any money repairing them? I watched the man for a minute then went back to my car, paid for my gas and drove away heading east on the Mother Road. Ten minutes or so later, I starting thinking about the old man. I thought about turning back to talk with him, to learn more about repairing fly swatters. But as each minute passed, so did another mile, and turning around became a bigger commitment. I kept going. I returned to Needles a few years later and stopped at the Texaco station. The man was not there, and there was no sign advertising fly swatter repair. I asked the station attendant about the man, but he said he had never heard of him. I was hugely disappointed in not learning about the man, and how and why he repaired fly swatters. Nowadays, I would never let a story like that slip by. Prepping your RV before it sits for the winter months is an essential step to ensuring longevity and a fully functioning RV come spring. With Road & Home™’s complete collection of RV plumbing parts, you can cross off your checklist with a quick trip to your local Lowe’s store. See our recommended tips for winterizing here. Is reading this newsletter worth 20 cents to you? Our staff works hard to bring you a valuable newsletter every Saturday. Readers help make it possible with their voluntary subscriptions. Even a pledge of $10 a year is appreciated — that’s less than 20 cents an issue! Many readers pledge more! Your contributions make it possible for us to write about important matters, not just fluff to make advertisers and RV industry big shots happy. Enter a voluntary subscription. Use a credit card, PayPal or mail a check. Former Pilot Flying J President Mark Hazelwood is set to begin serving a 12 1/2-year sentence for cheating some customers out of millions of dollars at the pump. For years, Pilot Flying J has been a popular fueling and overnight stopping point for RVers. Good Sam Club members receive a fuel discount as part of their membership. Based on Mr. Hazelwood’s crimes (and a vulgar, racist audio recording by an FBI informant), I’m not very excited about doing business there anytime soon. Read more. • Nebraska Parks to raise camping fees as sites cater to luxury RVs. • Firefighters can’t save burning motorhome on Washington highway. • Residents fed up with frequent flooding of their mobile home & RV park. • Camper van goes up in flames outside a Tim Hortons in Ontario. • Owner vs. town code: Is it a tiny house or a “custom travel trailer”? • Seattle councilman proposes RV lots for homeless RV dwellers. • Missouri RVer leads deputies on high-speed chase. • New York state officials’ questionnaire invites feedback on black bears. • Body of fourth person missing from flooded Texas campground recovered. • 300 pounds of pot found in motorhome after traffic stop. 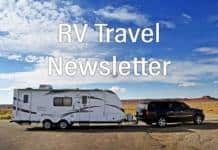 • Brake failure causes RV to roll over in South Dakota. • Fire possibly started by homeless RVers causes evacuation of Lowe’s store. • Travel trailers to become temporary homes to hurricane victims. • Fulltime RVer rescued from flash-flooded lake bed campsite. • Pa. State Parks adding free EV and hybrid charging stations. • Keystone recalls towables for axle issue. • Hymer recalls Roadtreks for potential battery acid spill. • Winnebago recalls trailers: Missing LP clamp could cause fire. • Jayco recalls trailers: Turn signal, brake lights wired wrong. • KZRV recalls trailers: LP manifold could leak, cause fire. • Forest River recalls trailers for possible brake failure. The Chicago law firm Robbins Geller Rudman & Dowd LLP has filed a class action lawsuit on behalf of purchasers of Camping World Holdings, Inc. Class A common stock during the period between March 8, 2017 and August 7, 2018 (the “Class Period”). … The complaint alleges that during the Class Period, defendants made false and misleading statements and/or failed to disclose adverse information regarding Camping World’s business, operations and financial condition. Learn more. RV manufacturers are recognizing the impact younger buyers are having on RV sales, especially small towables, illustrating that bigger isn’t always better. This has led to record-breaking sales growth this year as RV shipments are expected to hit their highest level ever, according to the RVIA, marking the industry’s eighth consecutive year of gains. Read more. Black Book reported that the average selling price of motorized units at auction last month increased by nearly 9%, representing the third highest mark in history, according to RVBusiness. “One thing that caught my eye was that there was a larger than usual amount of 2018 models in the mix, perhaps being disposed of to make room for some incoming 2019s,” said Black Book’s Eric Lawrence in a press release. Read more. This is a story of a white elephant – actually a Class B motorhome – that Russ and Tiña De Maris inherited from a long-time friend. Written in Russ’ inimitable style, it tells some of the older as well as more recent history of this classy RV and where it stands now – literally. Read more, and if you have a suggestion for Russ, please post it in the comments section below the article. Rick Dalton, a Louisiana RV lemon lawyer, talked with syndicated radio talk show host Alan Warren last week about what to do if you have a defective RV — one where no matter what you do it’s still sitting in the shop month after month. This is valuable information you won’t want to miss. Listen to the commercial-free audio podcast. Is the RV sales boom about to bust? For the second straight month, shipments from RV manufacturers declined over the previous year. The RV Industry Association’s September survey of manufacturers found that total RV shipments finished September at 30,969, representing a decrease of 29% from the 43,598 units shipped last September. Learn more. 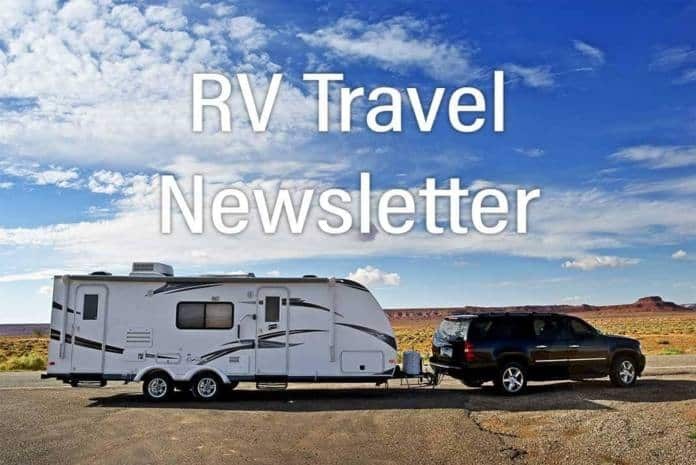 If you are considering an RV vacation to Yellowstone National Park next summer you may want to plan ahead for unintended and unforeseen delays and limited parking in the park as visitation continues to grow and crowds increase. Park staff recently released visitation numbers for September, and the jump from September 2017 was about 13 percent, with 724,454 folks counted this September. Read more. Pastor Donnie Davis’ dream is coming true – that on the 277 acres of land beyond the 65-acre lake in Franklinville, New Jersey, he can see little homes dotting the woods, housing his goal of 60 U.S. military veterans – for free. On Oct. 13, volunteers worked towards finishing a piece of that picture – its third microhouse, for 87-year-old Korean War Veteran Sigmond Ronis. Operation Safe Haven is a donation-based tiny house community for veterans struggling to get back on their feet after homelessness, struggles with PTSD, or general hardship. Read more. Bob Wells is not your typical RVer. But actually, that depends on who you ask. The free-range nomads that attend his Rubber Tramp Rendezvous in Quartzsite in the winter call it “The Real Burning Man.” The rally consists of an assortment of nomads driving converted delivery trucks, Roadtreks, vintage RVs, “skoolies” and the odd Prius, a few thousand altogether that gather in defiance of consumerist society. Read more. Would you pay $15/night for an electric hookup site at a truck stop? In Three Little Pigs lingo, your RV is made out of bricks; you don’t usually eat frozen boxed dinners; you’ve traveled to quite a few states; you don’t order from Amazon that frequently; you like to hike, bike and, well, sit on your couch; and you don’t love your Thor Ace motorhome. All this and more, right here. It is not always easy to visit some of our national parks in an RV, where parking is often limited and traffic is heavy. But Red Canyon Transit has announced that it will resume its free scheduled bus service into and within Bryce Canyon National Park beginning April 14. The Rainbow Point Tour, a free tour to the southern end of the park that operates two times a day, will begin operating the same day. Learn more. You’ve all heard how serious the Southeast takes their college football. One of the most intense rivalries is the Georgia-Florida game this Saturday, which also demonstrates how serious Southerners take their RVs. Loyal fans and their campers lined up days ago waiting to get a spot at RV City for Jacksonville’s most famous tailgate party, which is also called the “World’s largest outdoor cocktail party.” Read more. Tiny home communities continue to pop up, like this proposal before the Camp Verde, AZ, Town Council for a new tiny home agri-tourism community. In August 2017, Camp Verde Community Development Director Carmen Howard and her husband, David, purchased 15 acres of land adjacent to the Yavapai-Apache Agricultural Ranch on Cloverleaf Ranch Road. Their plans for part of the land is for a community of tiny houses on wheels, vintage recreational vehicles and agri-tourism events. Learn more. You might want to postpone visiting Canada’s Jasper National Park until May of 2020, when a “major facelift” that includes campground upgrades and removal of diseased trees is completed. Whistlers Campground’s new bypass lane at the east park gates and the removal of dead or dying trees due to the mountain pine beetle infestation are two of three major projects underway in Jasper National Park. Read more. On the road, the iCamp trailer from Dutch company Udo Camp rides as a flat trailer and looks like the rear-end of a sporty coupe. But in camp, the electric pop-up rises to an 8-foot tall shelter that sleeps and feeds up to four people. The iCamp’s electrically actuated roof rises in under 30 seconds at the push of a remote control button. Beyond that, setup entails dropping down the interior cabinets near the ceiling and arranging the interior furniture and cushions as desired for day or night use. Learn more. “On behalf of Florida State Parks, our hearts go out to everyone affected by Hurricane Michael. I know many in the Panhandle are still assessing the immense damage, but the recovery process has begun in communities and state parks throughout northwest Florida. In some parts, it will be a long journey.” Continue reading and learn how you can help. Last week Rich “The Wanderman” began a trip he believed would be wonderful and relaxing (yeah, right!) – but then a hose ruptured. And about 500 miles from his destination the brake pedal went to the floor. What happened?! • RVing today is a far cry from what it was a decade or two ago. • KOA: Where are the RVs? • Zap that filthy RV awning – with Mr. Clean’s help. • RV Electricity – Start me up … Generators and rooftop air conditioners. • What we learned about you last week (October 13-19). • How to get started boondocking in the Southwestern deserts. Protect your RV before it’s too late! Whether you’re chasing the sun or storing your RV this winter, NOW is the best time to safeguard against RV repair costs with a reliable RV Warranty. Pricing and Eligibility changes hit January 1, 2019, so don’t wait! Click the video or visit here to get a FREE RV Warranty Quote and roll into 2019 with peace of mind. Where to get RV registered and titled? We plan on keeping our NY state home, for now, and start traveling the country in a soon-to-be-purchased, used Class A diesel. I have found an RV that checks off almost all of our boxes. The RV is in Florida and I will be getting it inspected before making the offer. Since I live in NY, I’m trying to figure out about getting the RV titled and registered. Can anyone shed some light on the steps I should take? Will be flying back to NY on Tuesday, 10/16/18. Comment here. What can be done about RV park overcrowding? Forum members weigh in with their ideas. How about you? Comment here. Now that’s cool! Missing your favorite recliner? Miss it no more! This inflatable foot rest is perfect for lounging on the couch, in the chair by the campfire, or in the passenger seat for long drives. Take it on a plane ride, or take it to the grandkids’ soccer game (we know those can get long). It weighs less than 1 lb. and folds down small for travel. Learn more about this comfy foot rest here. Change from week before: Down 4 cents; Change from year before: Up 36 cents. Change from week before: Down 1 cent; Change from year before: Up 58 cents. Your motor coach fire escape plan should incorporate the needs of all the occupants, including the young, elderly and disabled. Remove any barriers that might hinder a disabled person and install extra handles on window escape hatches. Also arrange for a family member to assist those who may need help, and have disabled or elderly people sleep close to a safe exit. Jim Langley says he has a safer way to put on an RV cover: “We protect our 24′ Lazy Daze with a cloth RV cover. I was climbing a 7-foot ladder carrying the bundled cover up and tossing it onto the roof. I had to be careful or the cover would come unbundled and nearly knock me off the ladder. Then, I would have to go down the ladder, bunch it up again and try a second time. “Finally, I figured out a better way. First I stretch the cover out on the refrigerator side of the RV (this will make sense in a moment). I make sure the cover’s front and rear ends are oriented correctly and that the cover is not inside out. Next I place the ladder next to the RV right below the refrigerator vent on the roof. I make sure that the cover is between the ladder and the RV. “To put the cover on, I hold it in the middle by the edge of the side of the cover I want to end up on the other side of the RV. Holding one edge of the cover like this, I climb the ladder pulling part of the cover up with me, and then use two spring clips to attach that cover’s edge to the refrigerator vent on the roof. This keeps that small part of the cover in place on the roof. To finish the install, I climb the built-in rear ladder to walk on the roof. I hold the edge I attached to the vent cover and remove the spring clips. “It’s now relatively easy to pull the cover up and over the roof. Doing it this way is easier, quicker and safer than the bunched method because you pull the cover on with it correctly oriented and you never lift more than a small part of the cover at one time. You can do this alone but it’s better to have a helper on the ground who keeps anything from getting stuck below as you pull the cover up. I would recommend not trying to put on covers on windy days with either method – you can get blown off the roof!” Thanks, Jim! Don’t forget your TV antenna! Whenever you are using the TV antenna on your RV, hang the keys of the RV or tow vehicle on the TV antenna handle. This way you will never leave and forget the antenna was up. One of the most common repairs to RVs is a damaged TV antenna. Tip from Mark Polk, RV Education 101. First introduced in 2017 to RV manufacturers only, the cutting-edge Dometic RMD 10 refrigerator with innovations like a patented double-hinged door (it can be opened from either side), an elegantly designed controller and the best cooling performance on the market, is now available to consumers. The Dometic RMD 10 is the first model in Dometic’s new refrigerator generation for motorhomes. Learn more. Last week’s owner ratings: Thor Ace Motorhome. See the results. Read the rest of the question and Bob’s response (including several links for info on boondocking locations). Here’s a comment from our electrical specialist, Mike Sokol: “I’ve used DeoxIT for decades on my pro-sound gear. We use it on speaker connectors, power connectors such as cam-lok and twist-lock plugs (just like RV power), volume controls, gold-plated circuit boards (like in RV refrigerator control boards), etc. There are several different versions of DeoxIT depending on if you want built-in lubricant for potentiometers, or gold contact refurbishing or simply oxidation removal.” Learn more or order. Mike’s RV Electricity Newsletter Issue #12 arrives tomorrow. Sign up for it here, so you don’t miss this important information each month. Some folks insist that they “have” to drive at 70 to 80 mph while pulling 15,000 pounds of trailer on old, too-small tires. On forums with those comments, Roger tries to give the best answer from the point of extending the life of your tires. Plus, as a retired professional race car driver, he doesn’t buy the “speed kills” mantra. Read more. Soul food magic. Dirty Rice is a soul food favorite. It was once a dish prepared by the poor, who were given unwanted giblets and scraps from chickens prepared in the main kitchen. Now it’s a beloved tradition served at family get-togethers in the South and in Harlem’s famous soul food restaurants. Here is our shortcut version. Get the recipe. There’s something magical about riding trains. Why not plan a few hours from your RV journeys to experience the autumn color from a historic rail car. There are dozens of restored scenic railroads across the country. Here are just a few. This phone mount suctions, or clips to your dashboard or windshield, and is a sturdy, safe place to keep your phone while driving. Perfect for using the GPS while going down the road. The mount is cushioned for a wobble-free phone and can rotate 360 degrees. We highly recommend this one! Learn more or order. ROLL BACK: To work a deal backward. Instead of working with the purchase price and trying to determine a monthly payment, you would start with a known monthly payment and try to determine a selling price. It also means to “roll back” the odometer on an RV to make it worth more money – highly illegal. Casino Guide includes RVer info and coupons! The highly rated 2018 American Casino Guide provides detailed information on more than 750 casino/resorts, riverboats and Indian casinos in 41 states including which have RV parks and/or allow RV overnighting for free. Includes maps and more than $1,000 in coupons. Discloses the actual slot machine payback percentages for every state’s casinos. Learn more or order. Another useful quick tip from Mike Sokol! “I used to drag out a bottle of Windex and a roll of paper towels to clean the inside of my windshield periodically, but unless I was home to think about and do the task right then, chances are I would forget about it until the next time I had to drive at night. My wife just gave me a pack of Windex Wipes for my truck, and now I can clean up the inside of my windshield any time it gets a film of streaky dust. Works great.” Buy them here. The oldest known living tree in America is a Great Basin bristlecone pine (unnamed) in the White Mountains in eastern California. It is more than 5,000 years old, meaning it was more than 400 years old when the Great Pyramid of Giza was completed! The next-oldest known living tree in America is also a Great Basin bristlecone pine living high in the White Mountains. It is estimated to be about 4,850 years old and is known as Methuselah. The oldest computer can be traced to Adam and Eve. Yes, it was an Apple. But with an extremely limited memory. Just one byte. Then everything crashed. Editor and Publisher: Chuck Woodbury. Managing editor: Diane McGovern. Senior editor: Russ De Maris. Staff writer: Emily Woodbury. Contributing writers: Greg Illes, Bob Difley, Richard Miller, Richard Mallery, Dave Helgeson, Janet Groene, Gary Bunzer, Roger Marble, Mike Sokol, Chris Guld, Julianne Crane, Chris Fellows, J.M. Montigel and Andrew Robinson. Administrative Assistant: Gail Meyring. Marketing director: Jessica Sarvis. IT wrangler: Kim Christiansen. When I was a boy in the Rio Grande Valley, frosty cold Cokes from the machine were five cents. Heavenly. Question – Knowing that Chuck is “opinionated” 🙂 about some RV-related vendors, does the inclusion of an advertisement mean any sort of endorsement on his part? I am referring specifically to the RV extended warranty advertisement in this issue. My brake lines on my old Georgie boy had split so often I took to carrying the fittings a small vice and section of brake hose my size so I could make one on the fly. When I was a kid growing up in northern Pa soda was a nickle with a 2 cent deposit. So as long as you drank at the Mom n Pop store you only needed the nickle. As kids we would scour the roadsides for bottles, it only took 3 and a penny left over candy. Ah the good old days. Your story on the Flying J president struck a cord with me. About six years ago, when we were following the Mother Road west, I thought to use my Good Sam card at Flying J’s. Imagine my surprise when even with the 6 cent discount at Flying J, I could buy less expensive gas at just about any other station in America! Needless to say, to me, Good Sam fueling discounts are more scam than savings. Hey Chuck, about those two bit cokes you’ve gotten at the gas station. Hmmm I remember them being 5 cents & no deposit required. That when i was a paper delivery boy & made 7 cents a week from each customer back on the East coast. Those were the days! I was really lucky as I had 2 customers that had apple orchards & they always gave me free apples even if they didn’t know it. Maybe you were never really in Needles California, maybe you drove into the twilight zone and all of that was a figment of your imagination. Just a thought. ´That would make for a good episode with the same fly swatter title! Great story about the fly swatter guy! Don’t let opportunities to learn get away! I’ve stopped for gas in Needles myself, and heat is an understatement! I really didn’t misspell my name the first try. Autofill apparently doesn’t work flawlessly! Chuck, that great story should remind us all that some golden opportunities arise in our lives, and will never be presented again. On a whim, I did a web search (I refuse to say “Googled”) for “fly swatter repair”, and got thousands of hits on how to fix an electronic fly swatter. Bob Dylan was right: “The times, they are a-changin'” — every year of our existence. G’day, recent article about RV deliveries taking a nosedive and another right behind it about RV record sales. That’s not oxymoronic is it? What dishes do you use?